The Chubb Omega deposit safe range is the ideal solution for retail premises and vehicles that deal with large amounts of cash. It has an easy cash transfer window that allows cash to go and its anti-fishing technology means stored valuables can only be accessed by opening the safe. Simple cash transfer solution prevents both external and internal theft. 10mm steel door, 6mm steel frame, 20mm locking bolts protects against burglary. Can be anchored down to the floor to prevent removal. Available with key or electronic padlock locking system. Anti-fishing device prevents removal of deposits without key or access code. 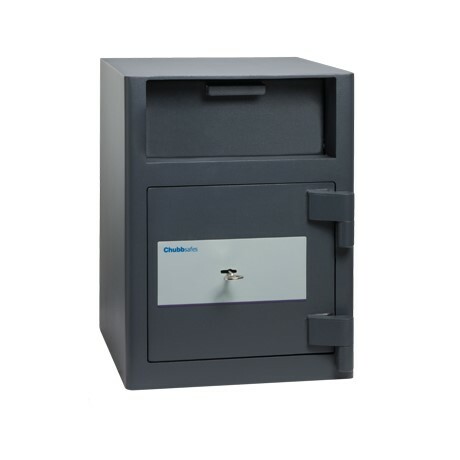 The Chubb Omega deposit safe range consists of two models of different sizes, the smaller version of the Omega can be fitted in the back of a van to secure cash and important documents. If you need more information about the Chubb Omega deposit safe or any other commercial or domestic safes from our extensive range, give one of our expert team a call on 0117 967 4994.